Opportunity zone chief Jill Levine arrives for the Opportunity Zone Community Celebration Phase II at Howard School on Tuesday, Sept. 25, 2018, in Chattanooga, Tenn. Parents, school faculty and community members gathered to note the accomplishments of the Opportunity Zone schools. Teach for America, an education organization that recruits and trains college graduates to teach in high-needs schools, could be one step closer to coming to Chattanooga. The Hamilton County school board will vote whether to approve a five-year contract with the organization at today's monthly meeting. The contract comes with a $250,000 annual price tag, or $1.25 million over the full five-year span. Hamilton County school leaders have been pushing for months to bring the well-known organization, which was founded in 1989 to combat teacher shortages. "We have five focus areas in the Opportunity Zone, and one of those is great teachers. Ultimately, our goal is to get the highest-quality teachers in front of our students in the Opportunity Zone. Right now, we have a teacher shortage; we are struggling to find teachers and we even have vacancies," said Jill Levine, chief of the Opportunity Zone. "The service that TFA provides is they go out and recruit top talent." A five-year, $1.25 million contract to bring Teach for America to Chattanooga is up for approval Thursday at the Hamilton County Board of Education meeting. View the memorandum of understanding here. The current proposal would pull $250,000 to pay for the program's first year from priority school grant funds provided by the Tennessee Department of Education, which are allocated to the district's nine schools that fall within the bottom 5 percent in the state. The 15 initial Teach for America corps members planned for the 2019-20 school year would be placed in those nine schools — Brainerd, Calvin Donaldson Elementary, Clifton Hills Elementary, Dalewood Middle, Hardy Elementary, Orchard Knob Elementary, Orchard Knob, The Howard School and Woodmore Elementary. Board member Kathy Lennon, of District 2, said TFA will help the district fill hard-to-staff positions. "I hope that [the proposal] goes through. I am a fan of Teach for America. I think it will help us with the Opportunity Zone. It will provide more teachers and resources for us and it will help close that gap," she said. "I think it's going to bring more diversity into our school system and I think that's needed." District 6 board member Jenny Hill echoed Lennon's thoughts. 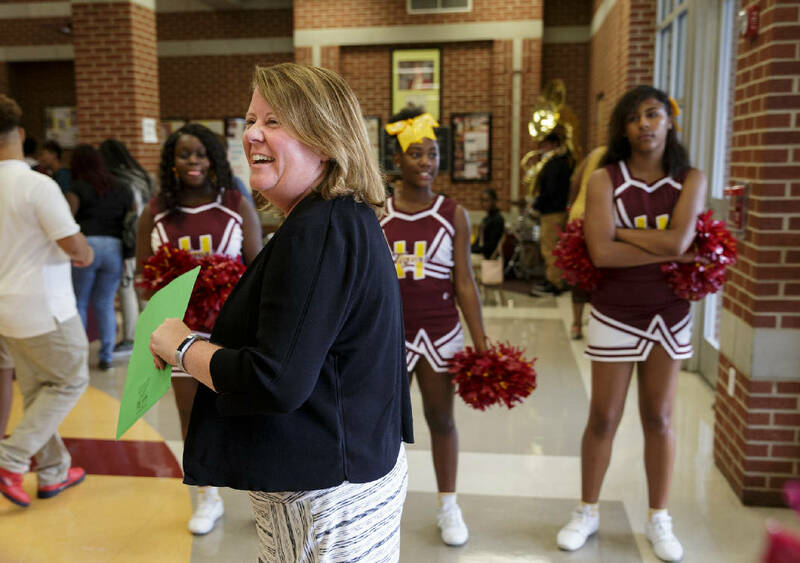 "TFA offers Hamilton County and the Opportunity Zone a good way to get teachers into positions that are hard to fill," she said. "I think it's good for students. We have classes without teachers in the Opportunity Zone, and that's not OK. But it's not an easy problem to solve, either." Teach for America programs already exist in Memphis and Nashville, and the Chattanooga office will initially be a satellite of the Nashville region site. This year, Nashville is celebrating the site's 10-year anniversary. Teach for America, along with traditional teacher preparation programs at colleges and universities, is measured annually by the Tennessee Higher Education Commission's Report Card on the Effectiveness of Teacher Training Programs. Last year, the state's Teach for America programs were among 18 of 33 programs that scored a 3 or 4, which is considered meeting and/or exceeding expectations. The University of Tennessee at Chattanooga's program within the School of Education scored a 2. Nationally, thousands of TFA corps members are placed in schools across the country in 51 regions each year. "Our vision is that one day all children have the opportunity to obtain an excellent education. We partner with communities, we don't do work to communities, we work with communities. Our ultimate goal is what the community wants us to do," said Benjamin Schumacher, executive director of TFA Nashville. "Our hope right now is over five years we would be able to build a network of TFA alumni and corp members that are at least 100 large [in Chattanooga]." In anticipation of a board approval today, Eric Dailey has been named deputy executive director for the Chattanooga site and started working with Hamilton County Schools and community organizations over the past month, Schumacher said. Gov. Bill Haslam and the state Department of Education have been in favor of expanding TFA in Tennessee, Schumacher said. This year, the organization secured a $1.5 million appropriation from the governor's budget for all three sites and to fuel expansion. Schumacher said TFA's mission is to provide resources to underserved students and communities and believes the organization will be the right fit for Chattanooga. "We aren't leading the charge in Chattanooga — we hope to support the ongoing work that is already happening," he said. The memorandum of understanding up for vote today outlines the hiring process of TFA corps members — who are recruited each year by TFA and trained over the summer — and compensation of the teachers. The $250,000 paid by the district will "defray expenses Teach for America incurred in recruiting, selecting, providing pre-service training and continuing professional developments services to the teachers employed by the school district," according to the contract. But board member Rhonda Thurman, of District 1, said she is concerned about the use of funds. "Can we not use that for something else? There's a lot of things we can do for $250,000," she said. "It's just another group that is going to come in with their own agenda and their own thing. We have a new HR department. Put the word out there that we need some new teachers. Why do we have to have someone else hire us for new teachers?" The district has invested in recruiting, retaining and supporting new teachers since Superintendent Bryan Johnson took the helm of the district in 2017. This year, the district launched a three-year induction program for first-year teachers that includes added professional development, mentorship programs and two new teacher coaches staffed in the Opportunity Zone. The board will vote on the contract during its meeting at 5:30 p.m. today at 3074 Hickory Valley Road.